Ever been to the end of the world? That's a good one to ask Aristotle! For me it was difficult to find. But visiting World's End in Horton Plains can be a different and pleasurable experience for all travellers and nature lovers. It can be accessed by travelling from Nuwara Eliya through "Ohiya", a small town with a Railway station. The road starting from Ohiya Railway Station leading across a park, climbs down to "Pattipola". There is a railway station at "Pattipola". 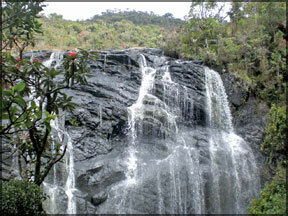 Hikers who like to have an adventurous experience can travel from Belihuloya. The journey to Horton Plains from Colombo is a five to six hour trip by road. The last lap is rather tough on low-clearance vehicles; a jeep or truck would be preferable. We entered the misty plains through Nuwara Eliya early morning. From the entrance you go in a circle to the end of the journey. From the main gate there are two routes to reach the World's End. We started from the right side as I yearned to see the magnificent Bakers Fall located before the World's End. And you find less people along this route unlike the other side. We went along this path in bright sunshine. But I did not feel too warm because of the cool breeze. At a point the lovely mist covered us and we couldn't observe anything for a few seconds. It was a unique experience and because of this sudden change in climate I did not feel tired even after finishing an 8km walk. Horton Plains lies at a height of more than 2,000m in the central highlands, and its altitude means that it has a much cooler and more windy climate than the lowlands of Sri Lanka, with a mean annual temperature of 16 AøC rather than the 26 AøC of the coasts. During cool season it is cold at night, and there can even be frost, although it rapidly warms up as the tropical sun climbs higher in the sky. The park covers 31.60 kmAý, and is a mixture of highland forest and wet grassland. This is home to Sambar deer which keep to the edge of wooded areas. "Here a large herd of elk, silhouetted against the clouds of the lowlands, move among scarlet rhododendrons. This is also home to the rhino-horned lizard, a rare relic species. Some lizards with outlandishly fluorescent green scales is also seen. 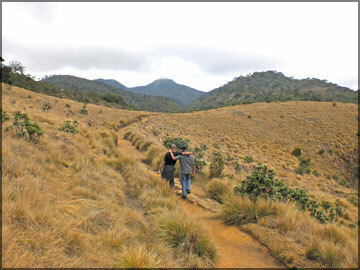 Park consists of montage cloud forests embedded in wet montage grasslands. Horton Plains has a rich biodiversity. Most of the fauna and flora found in the park are endemic and furthermore some of them are confined to highlands of the island," said Senior lecturer Wildlife Conservation and Management Department of Zoology Dr. U. K. G. K. Pathmalal. Cascading Bakers Fall displayed her magnificent beauty. Early morning visits are essential, both to see the wildlife, and to view World's End before mists close in during the later part of the morning. The plains offer her visitors many a wonderful sight and many experiences that few other places could give. In 'Journey to the End of the World' by Anu Weerasuriya, "The history of Horton Plains is inexorably linked with the European world. Many Britishers are locally commemorated by having landmarks named after them. Captain William Fisher and Colonel Albert Watson visited the area in 1834 and named this wild region after the Governor of Ceylon at that time - Sir Robert Wilmot Horton. A Major Thomas Skinner, however, also refers to it by the more lilting name of Willmanee". In this key wildlife area various animals can be found. This include leopard, sambar and the endemic purple-faced Langur. All six highland endemic birds are found here, including Dull-blue Flycatcher, Sri Lanka White-eye, Sri Lanka Wood Pigeon, and Sri Lanka Bush Warbler. Yellow-eared Bulbul and Black-throated Munia are widespread throughout the highlands. The main attraction at Horton Plains is the World's End. There are actually two of them which are called small world's end and the big world's end. They are about 1km apart from each other. From these, one could see the fall to the Tea estates down below. A merry 1000ft (328m) from the small one and a dramatic 4000ft (1312m) from the big one. From here one could get a fantastic view of the surrounding hills and the mountain ranges wreathed in mists and clouds and on clear days even the Indian ocean which is about 50 miles (81km) to the south is visible. From the World's End we had a fine and free bath. I felt that fall of rain was strange compared to the rain I had experienced in Colombo. Actually that was cooler and heavy. 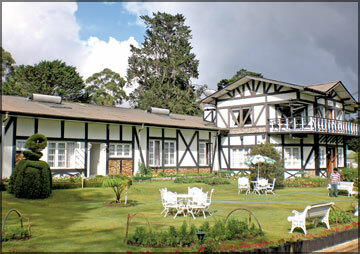 Nuwara Eliya is best-known of Sri Lanka's hill retreats. This popular tourist stop lies more than 6,000 feet above sea level and is an excellent base for exploring the delights of Sri Lanka's hill country. The Glendower Hotel is a cosy, value-for-money hotel, 200m from the town centre, and adjoining the golf course and Nuwara Eliya flower garden. Glendower Hotel is a small, homely hotel in the hills and it has an environment more of a feel of a Swiss chalet than a tropical retreat. The hotel has nine bedrooms comprising six standard rooms and three suites. The Golf Course and the Race Course is the main view of this eye catching place. For the preparation of meals their own garden vegetables are used. The restaurant specialises in Chinese food. If you do not like Chinese food, you can consider other options also. The small but well maintained garden is situated behind the hotel and you can have a cup of Nuwara Eliya fresh tea in the evening. The lovely mist can be a pleasurable experience for the guests. The hotel has won medium scale garden second place awards on six occasions at the 'Blooms' show organised by the Municipal Council of Nuwara Eliya. The hotel's original building was in existence since 1895 and without damage to the original building they added only a part of the building for the pub and bar in 1990. The pub is called 'The 19th Hole' and it has a 130 years old snooker table which is made of rosewood by Burroughs and Watts. From this pub guests can view the scenic beauty of the Glen Falls as well. 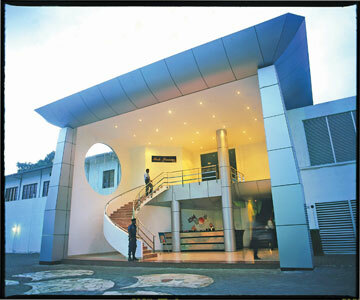 This is a family owned property and Vasantha Jayasuriya is the owner of this hotel. Being centrally located, there is access to many activities within Nuwara Eliya itself including a round of golf on the challenging 18 hold golf course of the Nuwara ELiya Golf Club, horse riding, boating in Lake Gregory, bird watching and nature treks. For those interested in culture and heritage - there are several heritage mansions that are worth seeing, the Holy Trinity Anglican Church and the Sita Amman Kovil nearby. Children will enjoy playing in the Victoria Park or a pony ride along the Race Course. Day's excursions are possible to Horton Plains, Haggala Gardens or to a tea estate and factory where you can learn about the famous Ceylon Tea and its production. The uniqueness of this hotel is the use of Tudor architecture for the wall. This is a Tudor Mano style hotel. Because of this architecture there is a very good demand from British. They have used thick wood for roof, floor and well crafted furniture too. Park Premier is a venue that caters for private as well as corporate events with facilities on par with any other star class venues in town. This is centrally located at the famous Excel World Entertainment Park down T.B. Jayah Mawatha, Colombo 10. Park Premier Banquet Hall is now becoming a preferred venue among many for functions such as weddings, homecomings, cocktail parties, b'day parties', gettogether parties and farewell considering its many unique facilities such as affordable rates, variety of menu options, personalized service, easy access and above all, its refreshing ambience. The Banquet Room is a 3500 square feet area and is connected with an expandable facility to an additional room with a floor area of 1250 square feet which can accommodate up to 250 people. "We have different types of cuisines to offer, and since we have reasonably priced, it is affordable to many. Our per head rates are start from Rs. 990 + vat per head and we always give the customer the flexibility to tailor make the menu according to their own requirement, said the Banquet Supervisor. Excel World Entertainment Park is a member of Excel Global Holdings Group and the marketing team could be contacted on 5555996/9 or 5766662. Serenely seated atop Athagala , the Elephant Rock : 700 feet above ground level , the Athagala Samadhi Buddha, benignly overlooks a city of medieval fame, Hasthisailapura, the on time citadel of Sinhala royalty. This monumental shrine is reminder of the great civilization of medieval Sri Lanka that, in the thirteenth and fourteenth centuries, briefly centered on the city below which, today, is yet thriving , and known as Kurunegala. Under pressure from foreign invasion the royalty progressively shifted their citadels south of the ancient metropolitan centres of Anuradhapura and Polonnaruwa. The monarchy moved first to Dambadeniya, then to Yapahuva and then briefly to Kurunegala in 1293-1341 AC, distinguishing it by the regal name Hasthisilapura. Ruins of the royal places and the Dalada Maligawa (Temple of the Tooth Relic ) are found near the Provincial Secretarial below the rock . A rock pool dating from medieval period is seen below the approach road .Originally the climb up to Athagala was made by a flight of steps carved out of the rock. A motorable road to the top was built in the early 1980s. The 66 - foot tall colossal image has been built by the Hsthisailapura Buduruwa Sangwardhana Society on the summit of the rock, some 1,100 feet above see level. The overall height of the statue and its pedestal and platform is 90 feet and the construction was done under the supervision of a team of consultant Engineers and a sculptor. The entire project was completed in twenty months and was declared open on 6th October 2003.The cost amounting to 20 million rupees , was met by donations received form Sri Lankan Residing here and abroad. Maintenances of the shrine is totally dependent on donations from pilgrim and visitors.